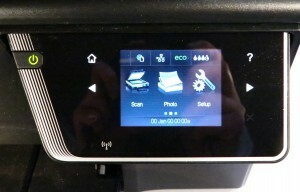 I am reviewing the Hewlett-Packard OfficeJet 6700 Premium business colour inkjet multifunction printer. This is the successor to the OfficeJet 6500 series of network multifunction colour inkjets pitched as a SOHO or small-business printer and has a similar capability to these printers. They have money-saving functions like a four-cartridge ink system and automatic duplex printing as well as a Super Group 3 colour fax and automatic document feeder. But this one, like the OfficeJet 6500a, also supports the HP ePrint ecosystem and Apple AirPrint abilities which allows email-to-print as well as app-driven walk-up printing. They also use a different cartridge to their predecessors but which cost similarly and have a similar page yield to these ones. The HP OfficeJet 6700 is the typical size of a SOHO / small-business inkjet multifunction and, like most HP printers offered nowadays, has the paper concealed in a tray that is fully closed. 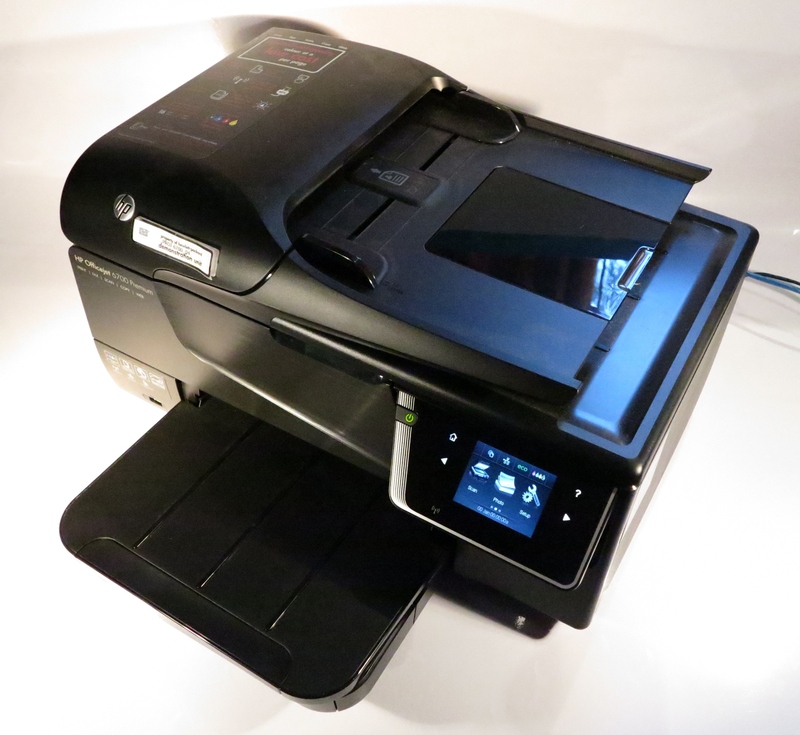 It is not as well-built as the OfficeJet 8600 Series but is still well built as expected for an office printer. The OfficeJet can become a high-quality colour copier which can also support ID copy abilities. It also can become a colour fax machine which works to Super G3 fax standards. The USB port on the front of the machine is for walk-up printing of photos held on memory keys or memory-card adaptors. It can support walk-up scanning of documents to the memory key but doesn’t support walk-up printing of PDF or similar documents. As well, it could benefit from working as a print device with PictBridge-enabled cameras. The ePrint apps allows the printer to work as a “walk-up” stationery or newspaper printer and even has access to the various document repositories like DropBox so you can have documents available to “print on demand”. The driver software setup was very quick and it didn’t need the printer to be fully awake for the computer to discover it. Even as the installer was loading the software on to my hard disk, the printer was being discovered as a destination device while it was in the dormant mode with just the standby light glowing. The print driver doesn’t draw too much on the computer’s resources and is able to give a rough preview of how the print job would appear with the current settings. It even provides just the basic setup options with the ability to go to the advanced options by clicking the “Advanced” button. This tactic avoids the need to think of “hope I have set it up correctly” and can benefit those of us who may find the computer difficult to use. Similarly, the scanning function that is part of this driver responds properly to control-panel-initiated scanning and doesn’t take up too much resources. Like nearly all HP network-capable printers, this printer supports the HP ePrint system which I have covered a lot on HomeNetworking01.info. This has the printer having its own email address so you can send documents to the printer at that address. It also has the ePrint Apps facility so you can turn out newspapers, forms and similar documents. 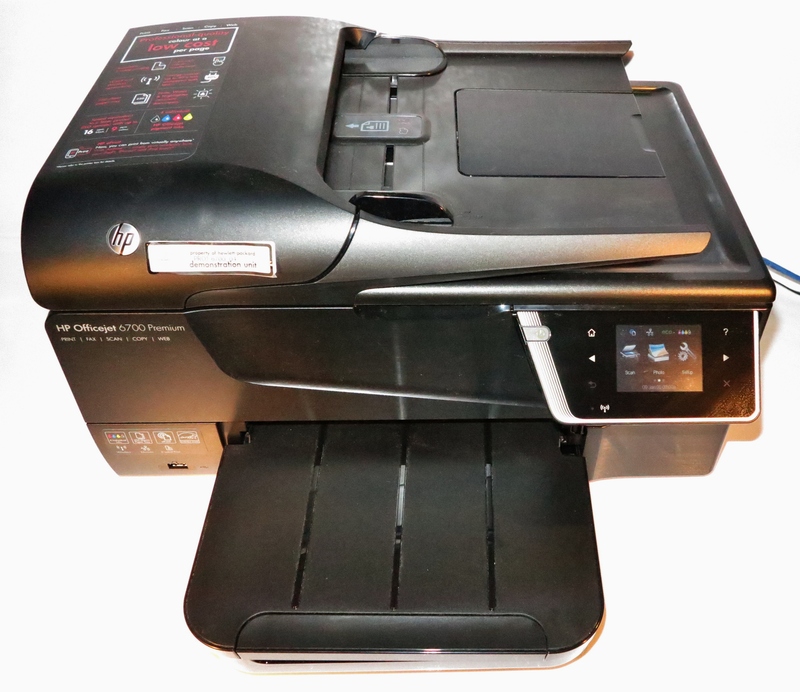 Like its bigger brother the HP OfficeJet Pro 8600 Plus, the HP OfficeJet 6700 has a front-loading arrangement for the ink cartridges. This avoids the need to mess with a heavy lid when you need to change the inks. But the print area isn’t illuminated which may be of concern if you had to identify the location of a paper jam in the print path. The speed in which a document is printed was very quick where it took only a few seconds to turn out one side of a document. The dwell time that has to occur between printing each side of a double-sided document was around a few seconds and could be capitalised on by slowly retracting the paper in to the duplexer while this occurs rather than pausing then retracting the paper. Speaking of this, I did a registration test on the auto-duplex function to see whether there was any drifting when a double-sided document was printed. The duplex print of the “Stop The Traffik” download-to-print door-hanger was exact in such a way that you could print then cut out the document exactly. This is a bonus for those of us who do desktop publishing and want to print booklets, door hangers, luggage tags and other documents where an exact lineup between front and back are critical. As I have observed from this, the printer has been very reliable with the basic print job which uses regular office paper. It didn’t matter whether the job was turned out on one side or both sides. The HP OfficeJet 6700 has a problem with the scanner when it comes to handling bound documents like books. Here, the unit shows up paper-jam error messages relating to the automatic document feeder if the lid is partially open and allowed to rest on the document, usually to allow optimum copying of these documents. The HP has shown a problem with loading and handling photo-grade glossy paper and doesn’t even support this paper as far as the driver is concerned. I even noticed that it shown up “out-of-paper” error conditions when it tried to feed the glossy paper where I had set the driver for “other brochure papers”. However, it loses definition in some areas and is weak with some blue colours but is OK with other colours including flesh tones. Being a cheaper printer, the HP OfficeJet 6700 has a smaller display which may affect useability with some older people. The automatic document feeder could be worked on so as to allow the user to partially close the scanner lid when they scan or copy bound documents. As well, like many multifunction printers equipped with this feature, it could be able to handle till rolls and thermal receipts in varying conditions when users scan these as part of receipt reconcilement for tax or expense reimbursement. Similarly, the HP OfficeJet 6700 could be set up to work reliably with glossy photo paper so as to handle photo printing tasks, which may be asked of in a SOHO environment. The walk-up printing abilities could be improved with an SD card slot for camera SD cards, PictBridge support and / or the ability to print PDF and XPS files off the memory keys. 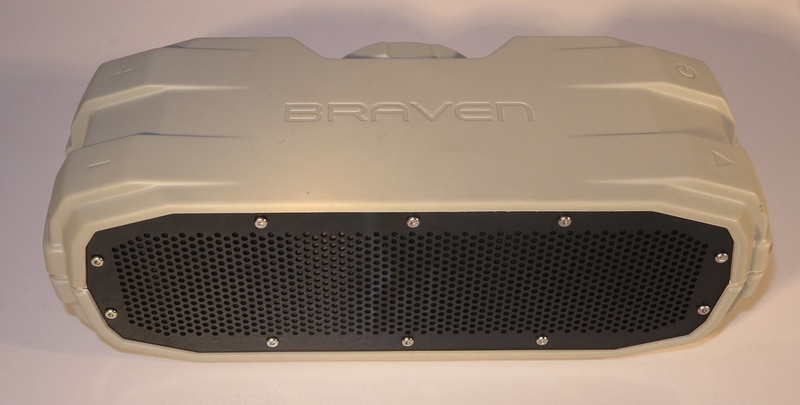 As far as connectivity goes, this printer should support IPv6 as this next Internet standard is becoming a “given” amongst business computing hardware and will be a standard for all network and Internet setups. Similarly, the fax could work as a T.37 / T.38 Internet fax endpoint as we move away from the traditional circuit-based telephony setup towards IP-based telephony. I would recommend that people purchase the HP OfficeJet 6700 printer as an entry-level printer for small-office / home-office use where photo printing is not important but fax use is important. This is more so if you want to use a business-grade printer in your home because of its high-capacity ink cartridges. It could also work well as a colour inkjet multifunction printer that you may use in your workplace as a secondary or “particular-user” printer. This may include applications like a reception-desk printer where you want one machine as a fax and ePrint endpoint.